Founded by David Davis in 1987, D&R Meats has became one of the leading wholesale meat suppliers in the UK. From the very humble beginnings of David working alone 7 days a week from one van and a trailer, he had the belief & determination that he could be one of the biggest & the best meat wholesalers. Some 32 years later, the company now operate a fleet of twelve vehicles covering markets all over the country, from Skirlington in Yorkshire all the way down to Portsmouth, our wholesale meat lorries can be found at many weekly markets. We have been based at Nuneaton market for over thirty years now, making us one of the longest serving members of the community serving generation after generation. 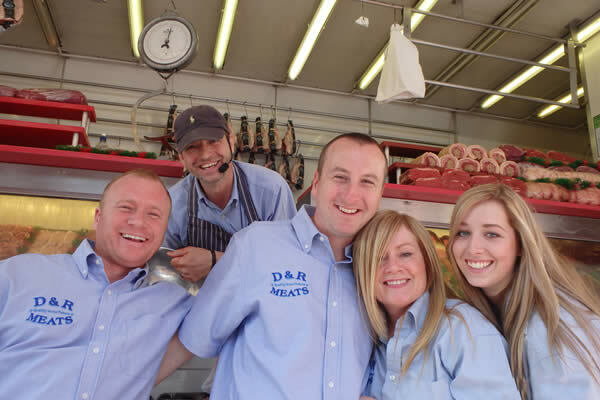 D&R Meats has continued to be a family run business, growing rapidly over the years into one of the largest meat auctioneers in the country. We take great pride in the reputation we have gained over the years for providing quality farm fresh products at reasonable prices. All our meat is sourced from both well established UK based producers, among specialised products such as lamb from New Zealand and beef from Australia, our aim is to provide the finest quality produce to both the public and to the wholesale sector, at trade prices. Visit our Facebook & Instagram pages for the latest information on offers & market locations. ©Copyright 2019 D&R Meats Ltd. All Rights Reserved. Incorporated in England. Registered No. 09512873.